While cockatiels aren't normally the most prolific talkers, they can learn short phrases with regular training sessions, just like larger parrots can. Cockatiels won't respond to punishment or scolding, so keep training sessions upbeat and enjoyable for your avian friend. With regular training sessions, positive reinforcement and repetition, most cockatiels, especially young ones, will begin speaking within a few weeks or months. A woman talking to a cockatiel perched on her arm. While female cockatiels can learn to talk, the males of the species are the best and clearest of talkers. This is likely due to the fact that the males communicate with the females through mating calls in the wild, which makes them more prone to vocalizing than their female counterparts. Begin training your cockatiel when he's around 3 to 4 months old, if possible, recommends the North American Cockatiel Society. Young birds are more likely to learn to speak than older birds, especially those who are hand-raised by humans. These little birds learn to vocalize by listening to their parents in the wild, making them more impressionable as youngsters to your training. When training your cockatiel to talk, choose short, single- or double-syllable phrases to start. Say each phrase in an excited and upbeat way to engage your bird's attention. Clearly enunciate the word and speak loudly when training your cockatiel, otherwise you'll end up with a mumbling bird, warns Julie Rach Mancini, author of "Cockatiel: Your Happy Healthy Pet." Interact with your feathered friend during training. Cockatiels are social birds who enjoy the company of their "flock." Your bird will be much more engaged when he's getting the chance to spend time with you while learning to speak. Keep the training sessions short, to around 10 to 15 minutes at a time, so your bird doesn't get bored or frustrated. Repeat the phrases you want your cockatiel to learn during daily training sessions and even throughout the day while you're interacting. Associate the phrases with fun activities such as getting a treat, playing a game or coming out of the cage. For example, say "Want a treat" when offering your cockatiel a favorite food such as some tasty millet or a yummy piece of apple. Start your day by greeting your bird with an emphatic "Hi" and say "Bye bye" when leaving. Soon, your cockatiel will learn to associate these phrases with certain activities and may begin to say them, recommends author Sally Blanchard of BirdChannel.com. If your cockatiel begins to speak, reward him with his favorite food when he does and praise him with an emphatic "Good." Continue to repeat the phrases he's saying, especially if his pronunciation isn't the best. Don't expect your cockatiel to have perfect pronunciation. These small parrots tend to speak quickly and in high-pitched tones. 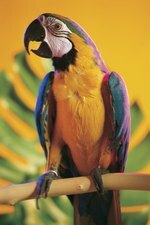 While you can record the phrases you want your bird to learn and play them during the day, it's best to interact personally with your bird to prevent him from becoming bored of your voice, recommends Mary Gorman, author of "The Cockatiel Handbook." Avoid whistling around your cockatiel because he may learn to imitate you. Whistling is an easier form of vocalization than speaking for cockatiels and can discourage them from learning to talk.